A very cool retro styled sequencer/sound module with tons of interactive music loops and styles. 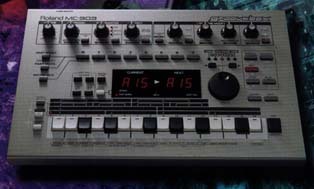 An indispensable tool for creating dance/techno music. It's got rhythms, it's got music, and it's as real-time as an electronic musical instrument can possibly get. - 448 dedicated dance sounds. Big thumbs WAY up on this baby! Also check CleverJoe's used page if you're hunting around for used gear.